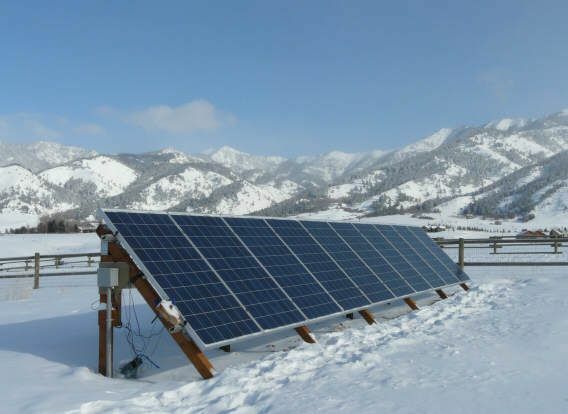 Solar electric systems operate at about 15% efficiency -- the remaining 85% is mostly turned into heat, which is wasted on nearly all current PV systems. 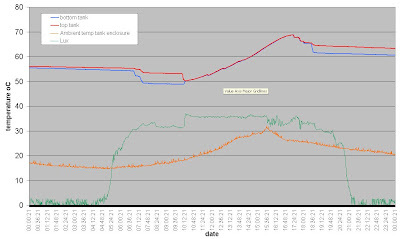 The heat is not only wasted, but it causes the PV panels to run hotter, which lowers their efficiency. 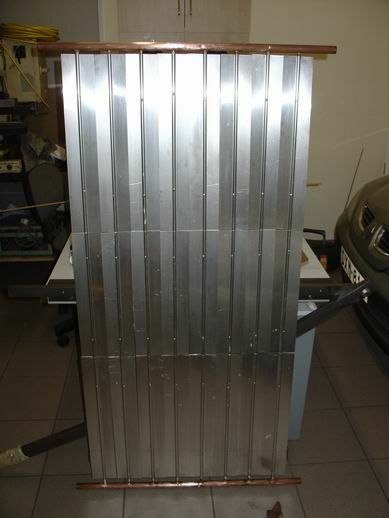 There have been a number of attempts to try to harvest the waste heat that PV arrays produce for space or water heating -- here are a couple fairly recent additions. 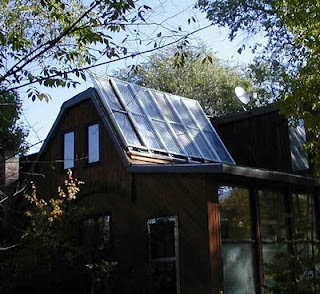 This system is a combined PV and solar thermal system. Conventional PV panels are spaced a few inches above the roof plane leaving a space between the roof and the bottom of the PV panels. The top and sides of the PV array are closed off so that the only opening for airflow is along the bottom of the PV array. Fresh air is drawn in under the PV panels along the open bottom edge, and is heated as it progresses up between the hot PV panels and the roof. Vents through the roof at the top of the array take the heated air into the house and use the heated air to heat domestic water and/or for space heating. 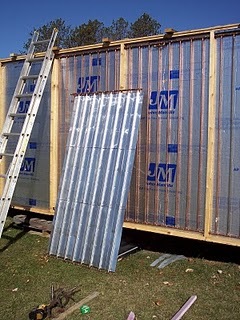 Heat from the cavity formed under the sealed PV panels is collected and used for space and water heating. 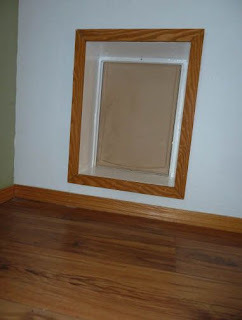 From a thermal point of view, the system is basically an unglazed collector that takes in ambient air and heats it all the way up to temperatures good for space heating (most solar heating systems get a head start by heating room temp air up). I would think that this system might work well in some climates, but the combination of unglazed collectors and heating all the way from ambient would seem to limit its use in cold climates? The SRCC report (link below) would seem to confirm this if it is for the same system -- the efficiency curve intercept is 0.24. The PVT Solar concept is a very simple, and could certainly be implemented on a DIY basis. 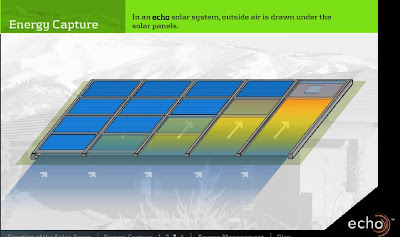 While the thermal performance is likely to be well under a good dedicated thermal collectors, the extra "free" thermal energy would likely be more than the electrical energy the PV array generates. I would love to hear from anyone who has one of these systems, or know more about them. This is a variation on SolarWall's well know transpired solar air heating collector system. 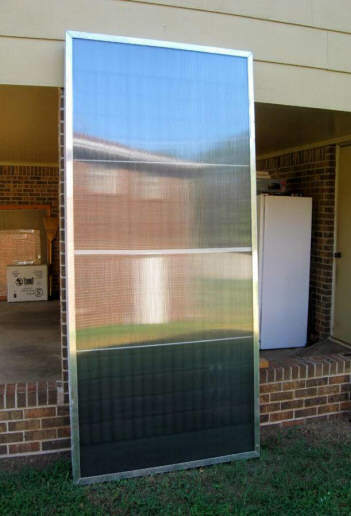 In this version, PV panels are spaced over Solar Wall's transpired solar thermal collector absorbers. The SolarWall collectors draw in the heated air behind the PV panels. It would be interesting to know how the thermal efficiency of this PV version of the Solar Wall compares to a regular Solar Wall. 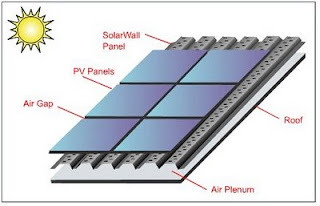 I would think the addition of the PV panels may reduce the thermal efficiency of the SolarWall because PV panels would not be as efficient an absorber as the SolarWall absorber they are shading? I did not see any detailed performance numbers on their site. It will be interesting to see whether these products do well. 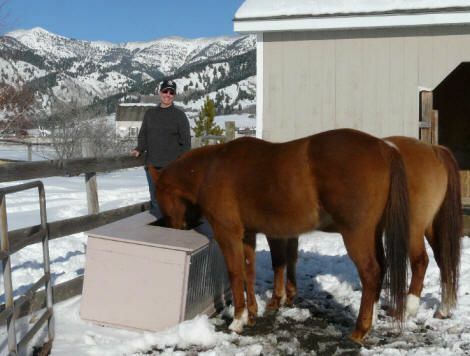 This is a really nice and simple design from Scott for a well insulated stock tank for horses or other livestock. 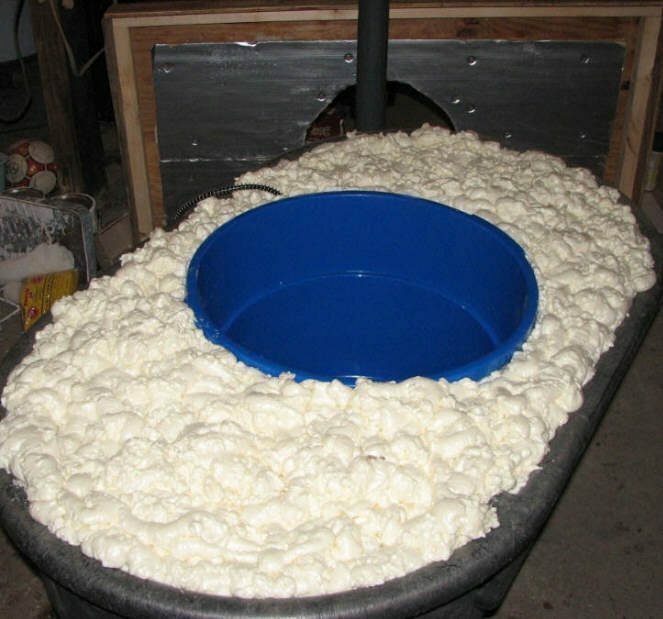 It is basically a tank within a tank with the space between filled with insulation. This shows the two tanks Scott used. The inner tank is a commercially available heated bucket, so with Scott's design there is no need to have a drop in the tank type heater -- the heater is built into the bucket. Adding insulation between the two tanks -- see the full story for how best to do this. And, this is the finished tank. Scott uses a KillAWatt meter to measure tank heater electricity consumption, and has seen a 61% in heater energy consumption. A drop from about 6.3 KWH per day down to 2.5 KWH per day! Thanks very much to Scott for sending this in! In other words, should you bother to get out there and clean off the PV panels when they are only partly covered by a light snow? While its certainly true that only a small amount of shading can cut a PV panels output considerably, I was a bit surprised by this in that snow lets a lot of light through. Its been one year since we put in our PV system, so I thought I would do a little report on how its performed, and what living with the system has been like. 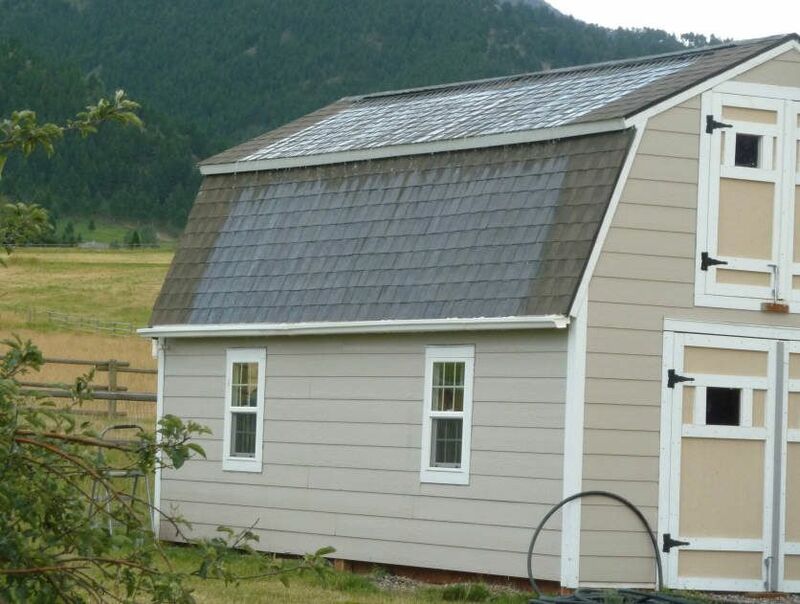 The system is ten 215 watt panels and uses the Enphase micro-inverters with each panel getting its own grid-tied inverter. 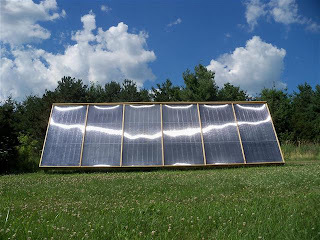 Our ten panel, 2150 watt micro-inverter PV system. The system has been trouble free -- no repairs or problems. The maintenance has been very minimal -- wash the dust off once in a while, brush off the snow, inspect the system for problems. The system produced 3320 KWH for the year -- about 8% more than PVWatts going in estimate. Building the mounts and installing the PV panels. 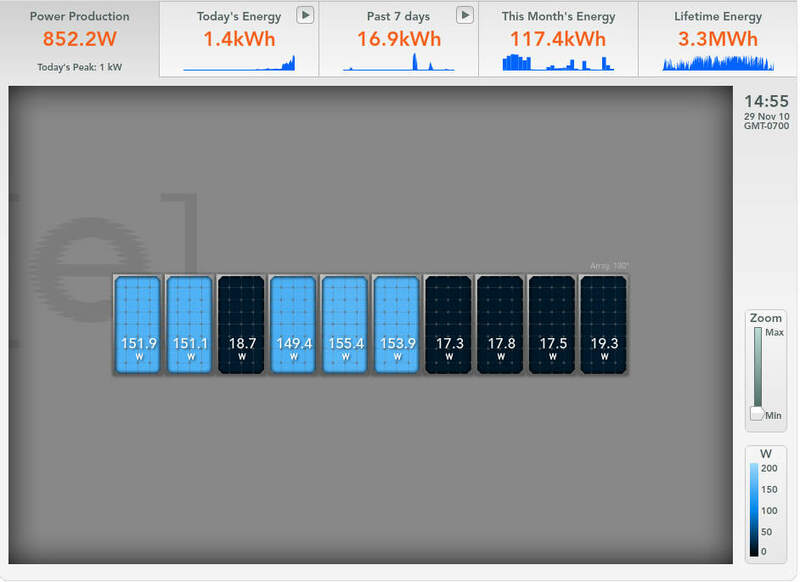 Its interesting (maybe) to note that when we moved into the house our power consumption was up at around 1000 KWH per month -- near the US average. 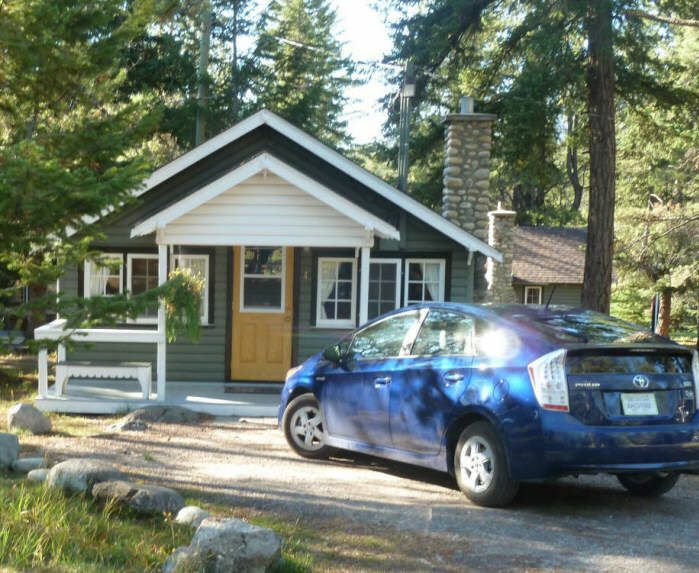 We pursed a bunch of conservation and efficiency measures which got our usage down to right around 500 KWH per month. All these changes are spelled out here in our Half Program. The cost of all the conservation measures was about $1,200 dollars. We then added the PV system, which generates about 275 KWH per month, and takes our net consumption down toward 200 KWH per month. 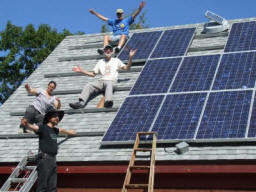 The PV system cost us about $10,000 ($6,500 after rebates). 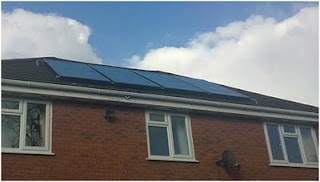 So, for us, the conservation measures were about ten times more cost effective in saving electricity than the PV system. 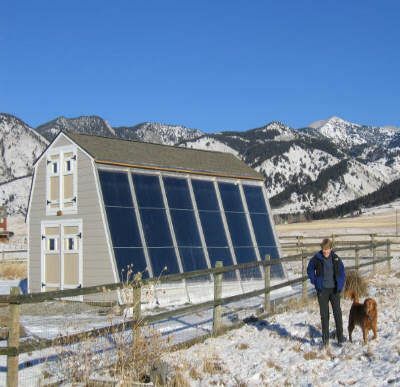 The message is do the conservation stuff first -- after you've gotten your consumption down, then think about a PV system to work on the remaining usage. 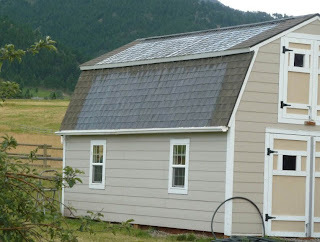 This approach will save you a ton of money compared to just installing a PV system that is big enough to meet your current usage. We are still working on conservation, and I think we can get down to less than 100 KWH a month -- maybe even down to a net zero for the year. A 100 KWH per month is a lot of electricity if used carefully -- as any off-grider will tell you. Starting in 2011 the FTC will require the yellow Energy Guide labels on new TV sets. I think this is a great development and will make it much easier for people who want to buy a low energy use and low carbon emissions TV to do so. We recently went through the TV buying experience and found it to be very hard to get good data on how much power a given TV uses. TV power consumption varies over a huge range and its large enough to have a significant effect on household power use. I found the Energy Star label program for TVs to be very unhelpful -- I'd go so far as to say its misleading. In contrast to the Energy Star labels, these Energy Guide yellow labels give actual power consumption and should be very helpful. If you are looking for a new TV, be sure to take energy use into account -- by looking carefully you can find a TV that performs very well and that uses substantially less power. I'd like to see these Energy Guide labels on anything that uses more than a trivial amount of electricity -- I think that it would make it much easier for people to take energy use into account when buying. A good next step would be to put them on those 24/7 power sucking TIVO type units. Kris's website covers the solar projects that he has tackled with good construction detail. 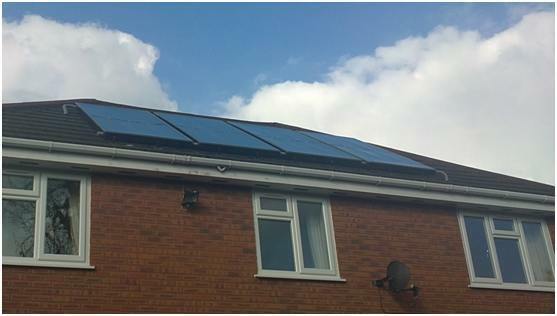 The projects cover solar space and water heating as well as a solar PV installation. The thing that really sets Kris's projects apart is the very high level of workmanship that they show. Everything Kris does is carefully thought out and built with great precision and care. A good place to get inspiration for taking your workmanship up a notch. Homemade heat storage tank and heat exchangers. The website is in Dutch with some pages translated to English -- the Google Translation tool is your friend. This page has a list of links to pages that detail the collector and storage construction. The list is easy to miss -- its right under the "News and blog" entry. 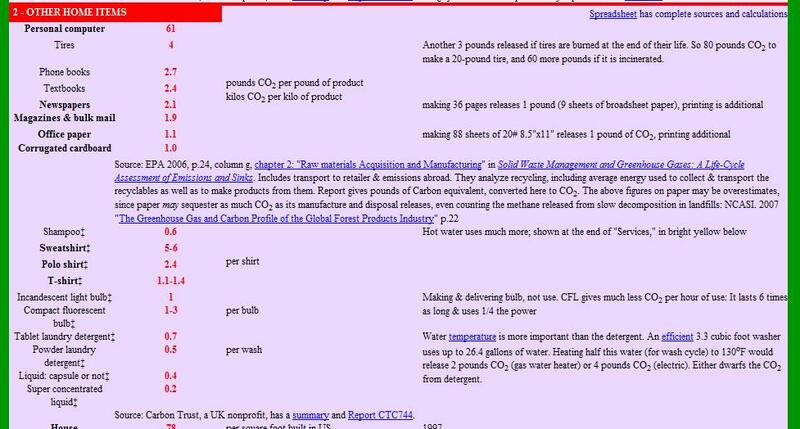 I've been looking around for a simple source of information on what the CO2 emissions associated with using certain materials are. 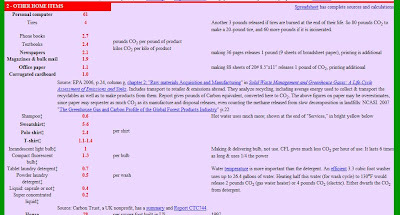 The CO2List.org site is the best I have found so far for providing this kind of information in a usable format. Small sample from the table. If you know of other good sources for this kind of information, please let me know. 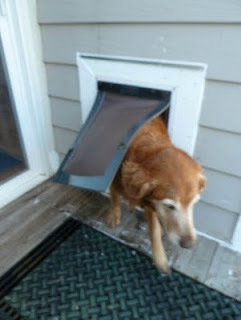 Sandy describes in detail his new $1K style solar water heating system. The collectors mounted to side of house. 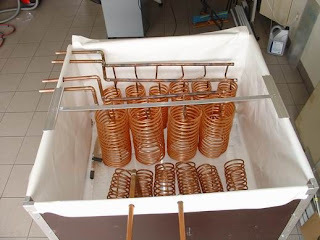 The collectors use a unique horizontal riser arrangement that makes better use of the copper tubing for horizontal layouts. 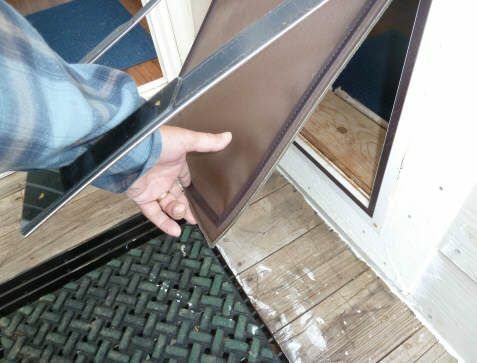 The collector mounting to the house is by a hook and eye arrangement that makes for minimal impact on the siding. space the coils out for better heat transfer. 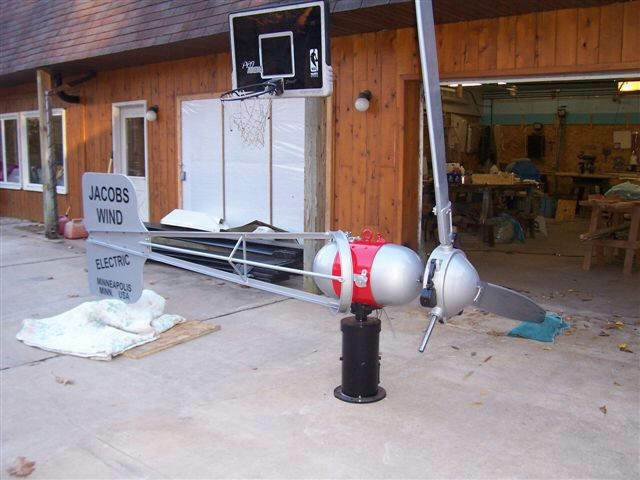 Note the small SwiftTech pump mounted on the side -- uses only 18 watts. The tank is very nicely done, and might be a good model for people who will have tanks located where they are visible and need to look good. 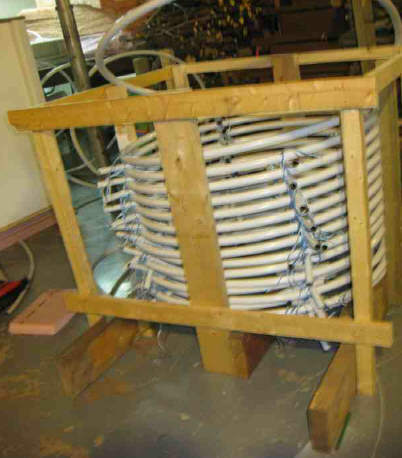 Sandy uses a 300 ft coil of 3/4 inch PEX for the heat exchanger, and took the time to rewind the coil for better separation of the individual coils to improve heat transfer. 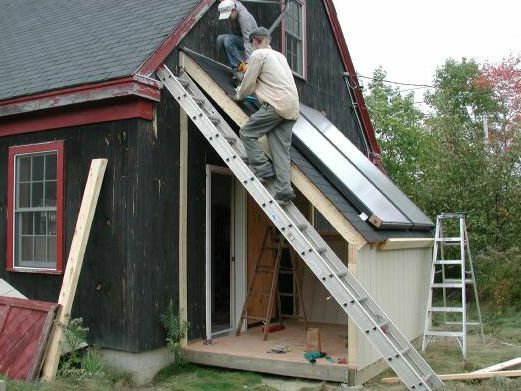 This solar water heater is a part of Sandy's overall plan to reduce energy consumption and CO2 emissions -- other parts include a new efficient boiler for space heating, upgraded insulation, a Prius, and more efficient appliances -- maybe we can talk Sandy into a report on how the whole program effects their energy use. Philip lives on the beautiful Pacific island of Fiji, where the scenery is stunning, but the utility rates are on the high side. 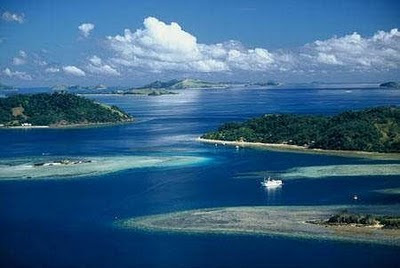 This picture just knocks me out -- wonder if Fiji needs another solar guy? 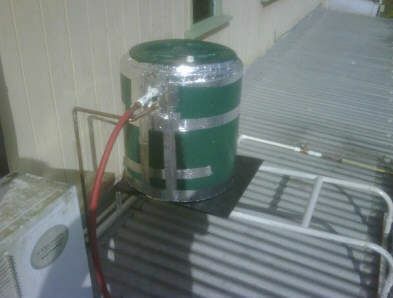 Philip worked out a nice and simple warm climate thermosyphon solar water heating system. 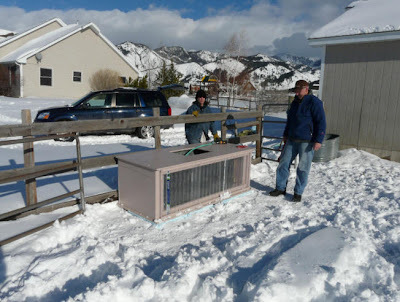 The system is very simple: no pumps, no heat exchangers, no differential controllers, no anti-freeze. Just a PVC storage tank located above the collector, and the thermosyphon effect does all the rest. The PVC solar heated water storage tank. The total cost was only $250 US. This is a very nicely done system by Thom that provides both solar domestic water heating and solar space heating. The 200 sqft, homemade collector with twinwall glazing. This is a drain back system with the 300 gallon heat storage and drain back tank located about 50 ft from the collectors in the house. When the sun is off the collector and the circulation pump is not running, the water in the collector drains back to the tank in the house for freeze protection. 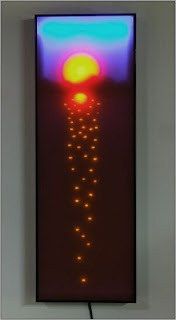 The collectors are modeled after the $1K Solar Water Heater design in which aluminum fins are thermally bonded to copper pipes. This design provides 96% of the performance of commercial collectors at 1/5th the price. Thom bonding collector fins to copper tubes. The lines between the collector and the heat storage tank are run in a trench through the yard. As the picture shows, the pipes are packaged up in XPS styrofoam insulation to reduce heat loss. 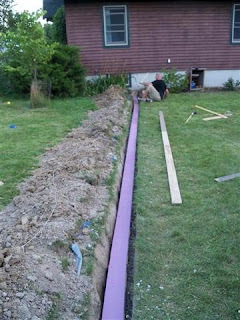 Insulated pipes going into the heat transfer trench. 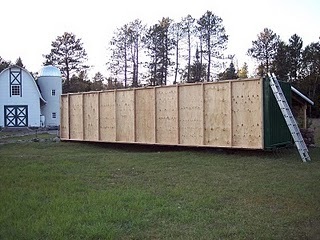 The tank is an EPDM lined and well insulated plywood box. 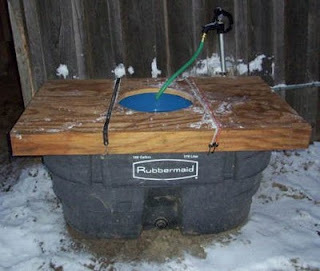 It holds about 300 gallons. While this kind of design may initially give you some pause, it is a well proven design that goes back to the 1980's and has a very good track record. 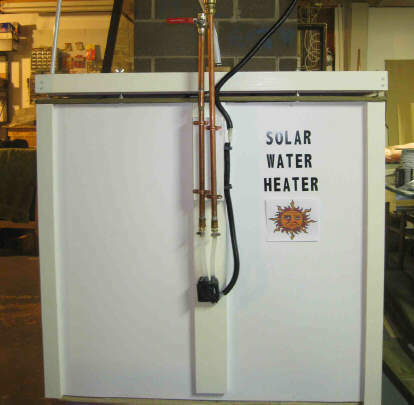 Thom is using the system for both domestic water preheating and for space heating. The domestic water preheat is accomplished by running the cold water supply through a 300 ft coil of PEX pipe that is immersed in the tank. This is a very effective preheat system that is 100% efficient for most water demands, as the water in the pipe gets preheated to full tank temperature. A 2nd copper pipe coil heat exchanger supplies water for space heating to a radiant floor. 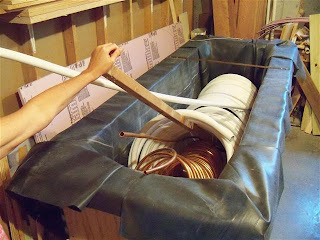 Depending on the details of the plumbing, it may not be necessary to use the copper pipe coil -- some have just pumped hot water directly from the tank, through the radiant floor and them back to the tank. 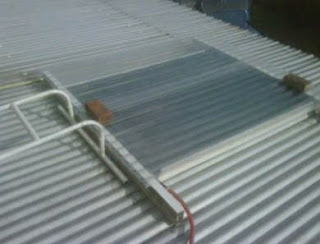 The EPDM lined tank with the two heat exchanger coils. Thanks to Thom for documenting it so well. Thom experienced some start-up difficulties with the system, and I have to admire the way he handled working through these -- things don't always go smoothly, and after putting quite a bit of effort into building a system, it takes some real discipline to work your way through unexpected start-up problems. Thom has done a good job of documenting these. 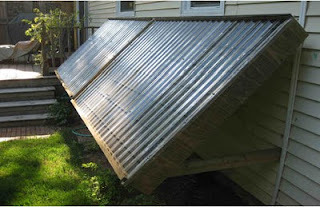 Greg's solar air heating collector uses recycled aluminum soda pop cans for the absorber. 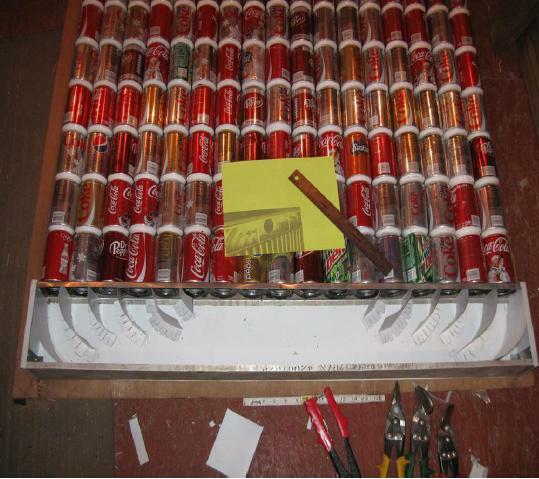 The pop cans have the tops and bottoms drilled out, and are assembled into vertical columns that the air passes through. 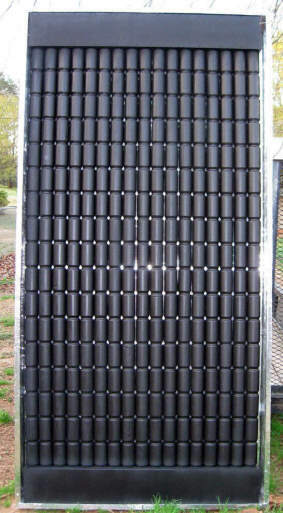 In operation, the black painted soda pop cans are heated by the sun, warming the air that is flowing up through the cans. A manifold at the bottom evenly distributes room air to all the can columns, and a similar manifold at the top of the collector collects the heated air for distribution back to the room. The combination of uniform air distribution to the whole collector and the large amount of heat transfer area from the cans to the air makes for an efficient collector. 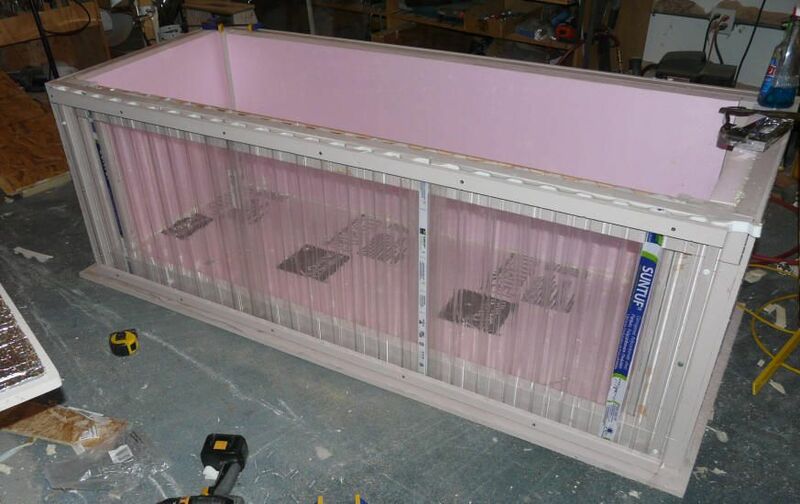 Greg's collector also uses Twinwall polycarbonate glazing -- this is a type of double glazing that reduces heat loss and increases the efficiency of the collector. Greg sent in a very detailed (22 page) description of the full construction process with lots of pictures. 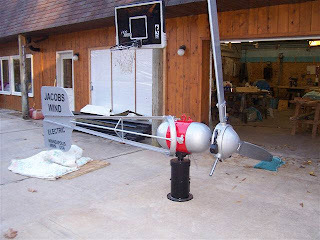 Thanks very much to Greg for documenting and sending in this project! 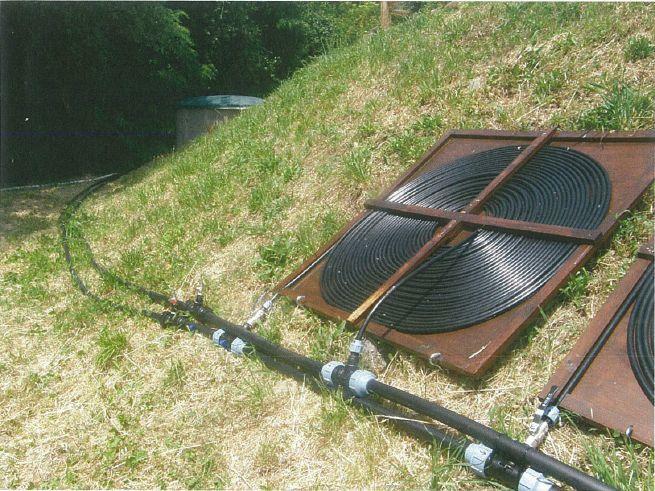 This is a nicely designed and carefully constructed solar pool heater for a swimming pool in Tuscany. Quite a bit of detail is provided on the construction and the performance. 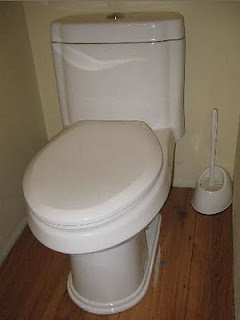 The plumbing arrangement is particularly flexible. The measured performance data indicate that the pipe coils achieve the same efficiency per square foot of area as conventional rubber mat style pool heating collectors. Closeup of one of the pipe coils. 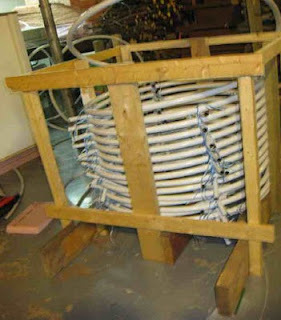 The plumbing layout for the pipe coils. Thanks very much to Steve for suggesting this.